When discrepancies in immune response arise between animal models and humans, some investigators are quick to question the adequacy of laboratory mice as a proxy for human subjects. Two collaborative studies, published in Nature and Cell Host & Microbe, suggest that animal model microbiome and health standards are key to interpreting these discrepancies - and that mice with more extensive history of pathogen exposure may better model the adult human immune response. Clinically healthy humans have remarkably dirty microbiomes, developed through years of pathogen exposure and adaptive immune response. Research mice, by contrast, are biologically pristine. When we explore how the adult human immune system interacts with infectious disease, or cancer, does developing animal models under health standards which exclude pathogens from the colony microbiome yield the most accurate possible models? Using distinct approaches, two research teams mimicked human pathogen exposure to create "dirty" mice. Both teams reported dramatic effects on immune system function when compared to barrier-raised mice. Through collaborative analysis of gene expression data, investigators concluded that barrier-raised mice have immune systems more similar to an infant's, whereas the immune system of mice with pathogen experience is more similar to a human adult's. What If We Abandon Health Standards? Drs. Stephen Jameson and David Masopust investigated the effects of pathogens on immune function by co-housing laboratory mice with "dirty" mice obtained from pet stores. Collaborating in a second study, a team lead by Dr. Tiffany Reese mimicked human pathogen exposure by sequentially infecting mice with pathogens representing common human infections. In Jameson and Masopust's study, three days after infection with Listeria monocytogenes, the dirty co-housed and pet store mice had over a 10,000-fold lower bacterial burden than the laboratory mice. However, in Dr. Reese's investigation, mice previously exposed to four pathogens had less potent long-term antibody responses to a yellow fever virus vaccine than unexposed controls. To better understand the genes influenced by prior exposure to pathogens, the teams performed a collaborative analysis of RNA microarray data. Investigators made comparisons between the peripheral blood mononuclear cells (PBMCs) of their "dirty" and barrier-raised mice, and also compared their findings to previously published human blood-sample data. In PBMCs from dirty mice, both teams observed strong up-regulation of type I interferon immune response genes. Notably, the pattern of gene expression in PBMCs from barrier-raised mice was more similar to gene expression of cord blood samples from human infants, whereas gene expression in PBMCs from dirty mice was more similar to human adults. Based on their observations, both teams concluded that laboratory mice have an immune system that is more similar to that of a human infants'. Dirty mice, having been previously exposed to pathogens, may serve as a novel method to study developmental stages of the human immune system. Analyses of germ-free mice and the microbiome reveal important contributions from commensal flora to immune-system function, as well as how the environment can influence this interaction. These latest findings extend prior research by suggesting that environmental pathogen exposure may help to "mature" the immune system, and they introduce a new tool (the dirty mouse) for exploring this concept. Dr. Reese believes dirty mice could offer insights extending well beyond immune system function. "I think we are still at relatively early stages of this research, but as more groups with diverse research interests start to pursue these concepts we will learn a lot more. And, hopefully we will improve mouse models for studying immune response, cancer, aging, and potentially other diseases in the process," she wrote. There has been a recent, burgeoning interest in immuno-oncology animal models, and virus-mediated oncomodulation is one area Dr. Reese is exploring. "I also think the question of how chronic co-infection changes cancer is interesting, and is something we are pursuing. The concept of oncomodulation is that viruses, such as cytomegalovirus, modify the oncogenic process. They may do this by changing apoptosis, cell migration, or other cellular mechanisms. I think it's also possible that they affect the capacity of the immune system to respond to tumor cells." While the "pet store model" scales poorly, Dr. Reese's work supports controlled pathogen exposure as a viable approach for creating relevant, immunologically experienced animal models for various research applications. As more investigators apply dirty mice to their work, we can expect advances which refine and increase their utility. 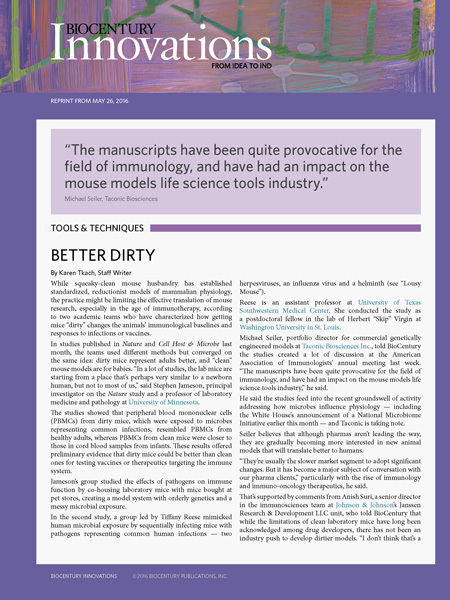 For additional insights into the impact of these two studies on the use of mouse models in immunology research, check out this recent editorial in BioCentury Innovations featuring commentary from Dr.'s Jameson and Reese, as well as Dr. Michael Seiler, Taconic's director of commercial genetically engineered models.